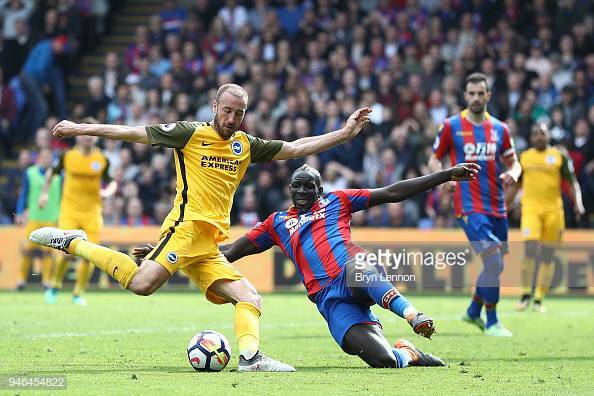 Brighton & Hove Albion host Crystal Palace on Tuesday night in what will be a feisty occasion as usual in the M23 derby. The Seagulls head into the game off the back of a great 2-1 win away to Huddersfield Town in what was only their second win on the road this season. Crystal Palace also head into the game off the back of a win at Selhurst Park against Burnley. Brighton still have Alireza Jahanbakhsh missing as he has only just returned back to training after picking up a hamstring injury which has kept him out of Albion's previous three games. The Seagulls will also still be without Dale Stephens who serve the last game of a three-match ban. Crystal Palace like Brighton have only one player out with an injury in Belgium striker Christian Benteke. Glenn Murray is someone who knows all about the M23 derby, having played for either side. Murray will luckily be on Brighton side, which is always handy as he has a knack of scoring against Palace. In the meeting between the two sides In January in the FA Cup third round, Murray scored the winning goal in a 2-1 win for Albion. Murray will be even more of a handful this season for the Palace defence, having already got seven goals from nine shots on target this season, which means he is not a man Palace will be wanting to allow to shoot. The player Brighton will need to keep an eye is Wilfred Zaha. The Ivorian forward scored two goals last season in the 3-2 win over Brighton at Selhurst Park and is always a threat to The Seagulls with his pace. A great example of this was in the 2-2 at home to Arsenal when with seven minutes left Zaha won a penalty after Granit Xhaka committed to a clumsy tackle on the Ivorian.